Target has released coupons for the above items and they are Target store coupons so they can be stacked with manufacturer coupons for even greater savings! Go here to print the coupons. The Children’s Place has released a new coupon for 15% off of one purchase. The coupon is good through March 16th, 2010. It can be used in the store or online. Limit one coupon per customer. There will be 3 inserts in this Sunday’s newspaper – 1 Smart Source, 1 Red Plum, and 1 Proctor and Gamble. Go here for a sneak peak! Regional differences are to be expected. 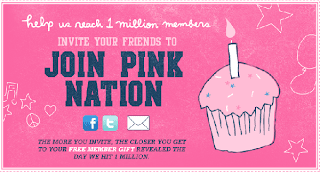 Head here to join Pink Nation at Victoria’s Secret. When they reach 1 million Facebook Fans they are going to give each member a free gift. The gift is a secret and they will reveal the gift when they reach 1 million fans. When I joined I received a coupon for $10 off a $35 purchase and a coupon for one free deluxe fragrance sampler. Go here to print a coupon for $3.00 off one Glade Sense & Spray Automatic Air Freshner Starter Kit. I added a new page to my website today that details all the ways I get coupons. Go here to read all about my quest to find coupons.